“We’re advocating for what we call Buildingomics – a new approach that examines the totality of factors in the building-related environment that influence the human health, well-being and productivity of people who work in buildings. Through Buildingomics’ multi-disciplinary approach, we aim to better understand the building-related factors that influence health in buildings and unlock the ability to optimize buildings for cognitive function and health.” Dr. Joseph Allen Assistant Professor of Exposure Assessment Science, Harvard T.H. Chan School of Public Health, and principal investigator for the study. Building on the findings from the CogFx Study – Indoor Environmental Quality, we continued our partnership with SUNY Upstate Medical to go from the lab to the real-world. The objective of this study, called CogFx – Buildingomics, was to evaluate the impact of green certification on productivity and health. The new study examines cognitive function in 109 office workers across 10 high-performing office buildings in five U.S. cities differentiated by climatic regions. In each city, the 2 buildings were matched by age, size and tenant with the key distinction being one sought green certification while the other did not. For example, in Boston the study team partnered with Harvard’s Office for Sustainability to use Blackstone South and Blackstone North as part of the University’s ‘Living Lab’ initiative. Pan left or right to see both buildings. Blackstone North and Blackstone South were both constructed in 1929; however, Blackstone South was renovated to double LEED Platinum (NC in 2007, EBOM in 2012). Read more about the renovation. Participants were studied for one week, where they filled out daily surveys, wore a watch to track sleep quality and completed tests of cognitive function on Tuesdays and Thursdays. During this time, the indoor environment was assessed. All of the buildings studied had similar air quality – including higher ventilation levels, low CO2 concentrations and low volatile organic compound (VOC) concentrations. As such, we refer to all buildings in the study as high-performing. However, in this study, thermal comfort and lighting differed between the two types of buildings. Green-certified buildings were generally less humid and brighter than the non-certified buildings. 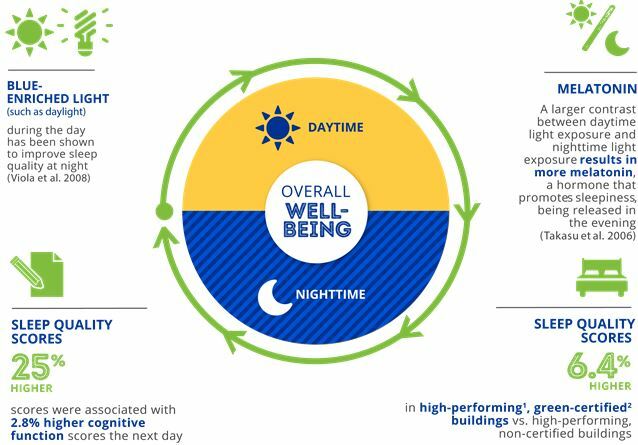 Occupants of green-certified, high-performing buildings saw 26 percent higher cognitive function scores, slept better and reported fewer health symptoms compared to those in similarly high-performing buildings that were not green-certified. The greatest cognitive function differences were seen in the areas of crisis response (73 percent higher in green-certified, high-performing buildings); applied activity level – the ability to gear decision-making toward overall goals (44 percent); focused activity level – the capacity to pay attention to situations at hand (38 percent); and strategy (31 percent). Participants within the ASHRAE Standard 55 thermal comfort zone performed 5.4% higher on cognitive simulations than those outside of the thermal comfort zone. In addition, better lighting was associated with better sleep. Researchers noted 6.4% higher sleep quality scores in high-performing, green-certified buildings versus high-performing, non-certified buildings. A 25% increase in sleep scores was associated with a 2.8% increase in cognitive function scores the next day. What does this mean for building owners? This suggests that there may be an even greater benefit to pursuing green building certification than originally thought. The extra steps taken to obtain certification do more than reduce energy consumption or support sustainability goals, they have a measurable, positive impact on the thinking and health of those who occupy the building. Better buildings that result in better thinking and health can help enhance employees’ performance and well-being; serve as recruiting tools for business HR managers; and provide a differentiator, perhaps even a competitive advantage, for building owners.